Saturday, January 5 at 11 AM – 2 PM: Kick off the New Year with the first SUP Pop Up event presented by Destination Panama City. Join us in Panama City, Florida for a 1 mile paddle along St. Andrews Bay. This donation based event will benefit a future public art project. Afterwards, all participants (over 21+) will be rewarded with a complimentary beer provided by Grayton Beer or Soda provided by Coca Cola. Limited Quantities Apply. 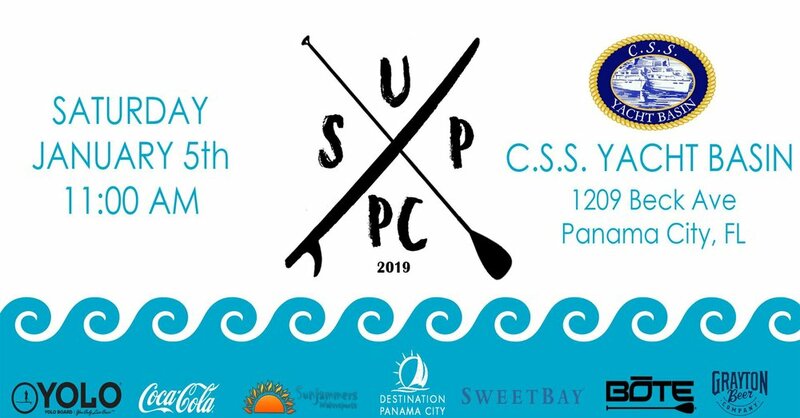 This community event will set out with a ½ mile stand up paddle from the C.S.S. Yacht Basin to a marked trail-head at the gateway to Lake Huntington to then turn around for the ½ mile paddle back to the C.S.S. Yacht Basin. All skill levels are welcome, being comfortable in the water as well as comfortable going from kneeling to standing are necessary to participate in this experience. If you intend to bring your own board, please be sure that your paddle board is under 12’ and that you have a Coast Guard certified life vest and paddle. What to wear: swim shorts, lightweight fitness clothing, rash guard shirts, or bathing suits with shorts - bikinis are not ideal for this type of workout. The forecast predicts a high of 64 with 4-7 mph northwest winds, so it should be a fairly pleasant day on the water. #LOVEPC shirts and Destination Panama City hats will be available at the suggested donation price of $10 each - the proceeds will benefit a future #ArtCityPC public art project. On site registration for the race begins at 11 AM Saturday morning at the C.S.S. Yacht Basin (1209 Beck Avenue) next to the Market of St. Andrews. Must have valid ID and a waiver will need to be signed to register. The race will be completed by 1:30 PM. The Little Village, located at 2808 West 12th Street, has graciously offered to be the after party location for race participants and spectators to enjoy some great local live music. This event was made possible by Destination Panama City, Grayton Beer, Bote, Yolo, Sunjammers, The Shack Pub and Grub, Coca-Cola and Sweet Bay.